Lagamo 4-pc. Sectional Sofa With its stylish take on comfort, the Lagamo microfiber 4-piece sectional creates a clean-lined silhouette that practically begs you to put your feet up. Upholstered in Bravado Ash microfiber, this sectional's soft, neutral palette works in any living room decor. With its stylish take on comfort, the Lagamo microfiber 4-piece sectional creates a clean-lined silhouette that practically begs you to put your feet up. Upholstered in Bravado Ash microfiber, this sectional's soft, neutral palette works in any living room decor. The couch is comfortable and looks beautiful in our four seasons room. The pillows look great with a teal area rug and teal accents. We added an additional armless chair to make it longer to fit our big room and it is perfect. Friendly and careful delivery as well. We love it! I probably sat on every couch in the store and am so happy I decided on this sectional. Absolutely love it! Very comfortable and fits perfectly in my living space. The sectional was exact what we expected. We were a little nervous about the size vs. space, but once set up it was perfect! Comfortable, soft, and looks great. We’ve only had it for a few days so durability is up for debate, thus far no complaints. Love this couch very Comfortable fits perfect in the living room!! Decent sectional recliner in that price point. Requires a lot of space. It was a nice couch but it requires at least 5" off the wall to recline. It did seem a little flimsy when reclining fully. We needed to return it because we were already at a maximum size for the sectional and the sales person didn't mention the space requirements to fully recline. Do your research so you don't get hit by a 2x shipping charge. How far do you need the couch from the wall for it to fully recline? BEST ANSWER: The Lagamo Sectional fully reclines with 5" wall clearance. To fully recline, we have the sectional about 6 inches from the wall. Hope this helps! does the sofa come in right and left facing sectional? BEST ANSWER: Hello Cindy, thank you for your interest in the Lagamo 4-pc. Sectional Sofa. This collection does not offer a sofa piece. This specific sectional includes a left arm facing loveseat, corner, armless chair and a right arm facing loveseat. We offer a variety of configurations for this sectional. Oh yes, the armless chair piece can be placed on either side! Sorry, I did not understand your first question. The armless chair can not be placed on either the right or left side? 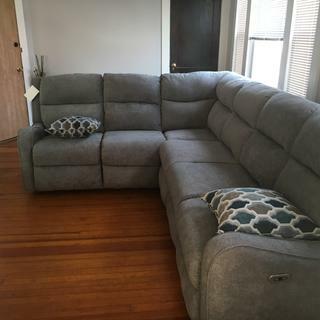 Does this Lagamo sectional come in other colors? BEST ANSWER: The Lagamo 4-pc. Sectional Sofa is only available in Bravado Ash, as you see online. Can another color be an option to order? If so what colors are available? It also comes in a light tan and a medium brown. These two colors must be special ordered. I asked our R and F salesman to have color samples sent to us. The gray is available for 3 day delivery.